In your slow-cooker (coated with cooking spray) place a large onion that has been sliced. 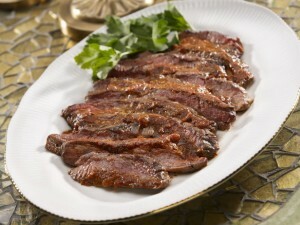 Add a 3 pound flank steak on top & sprinkle a packet of dry onion soup mix & 1-14.5 oz can of stewed tomatoes (undrained). Cover & cook on low for 8 hours (overnight). In the morning, stir together 3 stalks of celery (chopped) & 1 can of cream of celery soup. Add to the slow cooker & cover. Cook for 8 hours more.